I have an idealist streak in me and I take injustices and problems, especially in churches, as a blow to my sense of what is right in the world. I get easily discouraged and angry. I fantasize about churches where people “get it” and the life and work of Jesus is taken seriously. I romanticized the early church as containing a group of people who never were distracted, selfish, or in turmoil. But I guess I haven’t read my New Testament well enough. Paul’s letters were primarily letters to churches who had some problem or another and Paul was writing to set them straight. Now, in Revelation, Jesus through John, is addressing seven churches who need encouragement and exhortation. It turns out that these churches contain individuals who barely resemble what they once were in Christ, or have turned their back on the faith and are pursuing other idols and pagan practices. Others are so non-distinct and complacent that Jesus is crying for them to be either hot or cold instead of lukewarm. Otherwise, he will have to spit them out of his mouth. All of this to say, the early church had as many problems and maybe more serious ones than our churches today. And, these churches are made up of people who are just as prone to being derailed by culture, or losing their passion for Christ, or falling into false teachings as individuals today. People haven’t changed a whole lot in 2000 years. The message for us is the same as it was for the early church. 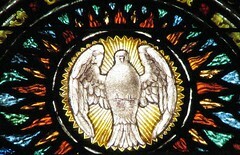 “If you have ears, let them hear the message of the Holy Spirit.” Open our ears Lord, let us hear. This entry was posted in revelation, spiritual formation and tagged Church, Early Christianity, Holy Spirit, Jesus, New Testament, Revelation by Scott Jeffries. Bookmark the permalink.